In the early 1920s Gibson added a number of innovative features to their line of mandolins and guitars. 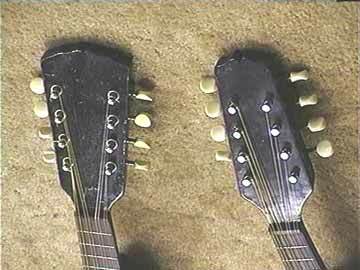 One of the lesser improvements was a simple change in the peghead shape which allowed the strings to pass from the nut to the tuner post without bumping into each other. Instead of flaring wider like most, these pegheads converge at the upper end. The instruments made during this period of change have a reputation (and rightly so) for sounding better than their predecessors. Because they are more desirable and valuable as vintage instruments, mandolins with this tapered peghead shape developed quite a following. It's not too much of a stretch to visualize a pit viper's head when describing these pegheads. On the right, a 1924 "snakehead" model. The instruments are the same model, but sure enough, the "snakehead" sounds better, and has a slightly narrower more playable neck.